I got thinking about getting some of these blocks into rows, Or I will never get this pieced together. I knew I wanted the three machine applique blocks to be a a different row from each other. I knew that if one was up one would be down and one in the middle height. I needed to rely on the design board to find the place for the blocks. Problem the blocks were not sticking to my design board (batting hanging on the wall). I took a day off and rebuild my design board. I now have two 4 x 8 sheets of insulation covered with batting and then covered with white flannel. I thought then I could pin right in to my insulation. Guess what it is so sticky the flannel and batting that I did not need pins at the block stage yet. wow! To get to this stage of rows, I measure each block height and width. I labeled the blocks and stated to sort the blocks by width. I had one block that was 25" wide the next size was 20". What to do? I decided I would do three rows up and down then one or two across (one on top one on bottom). I could use this wide block on the top or bottom row along with some of the shorter blocks. I had to stop the row building and finish more blocks like this one. I love this blue. 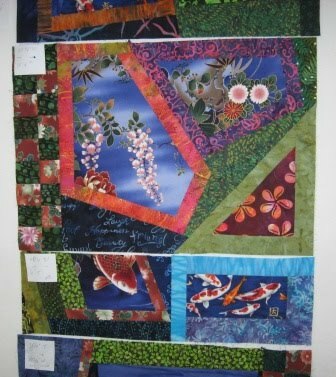 It helped give more bright colour back into this quilt. Can you see how great the four patches and the old strip sets are helping me. Great for fillers and adding more variety. I thought I would talk about the colours more. 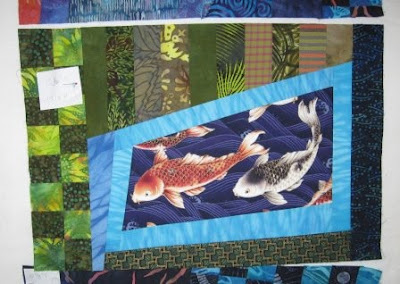 I started this quilt with three fish fabrics. 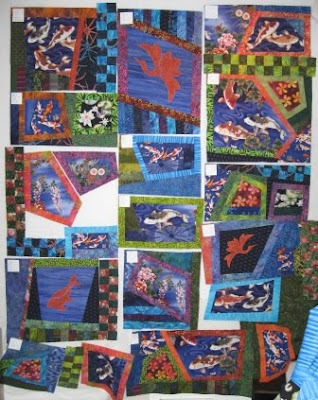 The fabrics are mostly blue some green and the orange fish. I have a real fish pond outside with gold fish and kio. They are Orange. I do not like orange and I do not use much orange in my quilts, ever. 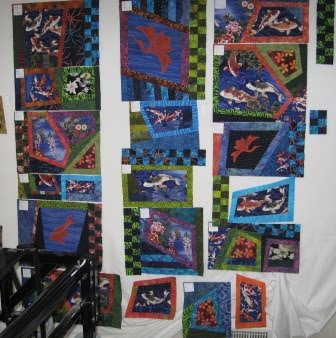 I wanted this quilt to be mostly blue green and the highlights of orange. I found when I started, the quilt was way to dark. Rather then change my basic colour, I would have to use the brighter bits of my Blue and Green and make sure I used more orange. Some more orange was added with a flower print that was almost a brown orange (used in the four patch in the photo below). You may see I have a little bit of pink, I thought the flowers in the prints have some pink so I added just a little. More Variety. More is better. I have still made this a blue green quilt with the complementary to blue, orange. I had some holes in my rows and needed more blocks. Or at least more finished blocks. This was how I got this done. I ended up making one more big block and a shorter wide block. My rows are not yet the same width and I will have to play with the sides and add or take away some filler fabric. The bottom row is weak and needs more work. Are You enjoying my puzzle? I love comments. Thank You all for your encouragement. 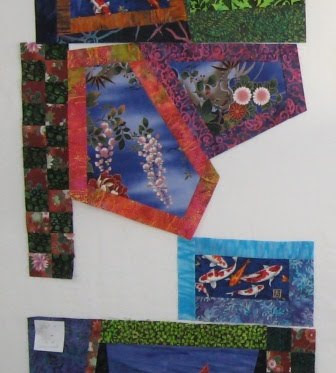 I have had trouble quilting on my work. The blog is helping. Looking at blogs have helped me find some new projects I want to make next. 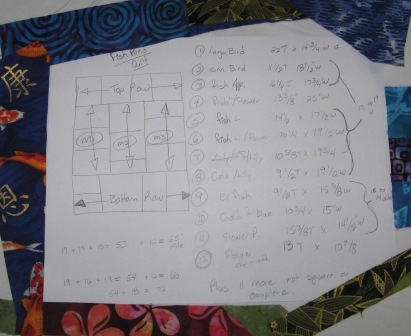 Have any of you had trouble quilting? How did you get out of the funk? I am really enjoying watching this come together. i have a few ideas sketched for some blocks that I want to do something different with. Right now trying to finish some UFO's and samples for class at Satin Moon. When classes finish for summer I hope to play with some ideas. Best way to get out of the funk is to do something completely different that you want to try and just take a break......I think. No guarantees.